San Joaquin County (East of the San Francisco/Oakland Bay Area) has seven cities and 746,868 people. Its diverse industry mix of agriculture, e-fulfillment centers, advanced manufacturing, data centers/call center and service industries has attracted companies like Applied Aerospace, Amazon, Tesla, Pacific Medical, Medline, FedEx, Owens & Minor, and Crate & Barrel. Located less than 60 miles from the Port of Oakland, its transit modes include: the Port of Stockton, Union Pacific Railroad and BSNF Railway Intermodals, Stockton Metropolitan Airport, and a highway transportation system that links the county to major urban markets through Interstates 5, 205, 580, and State Route Highway 99. 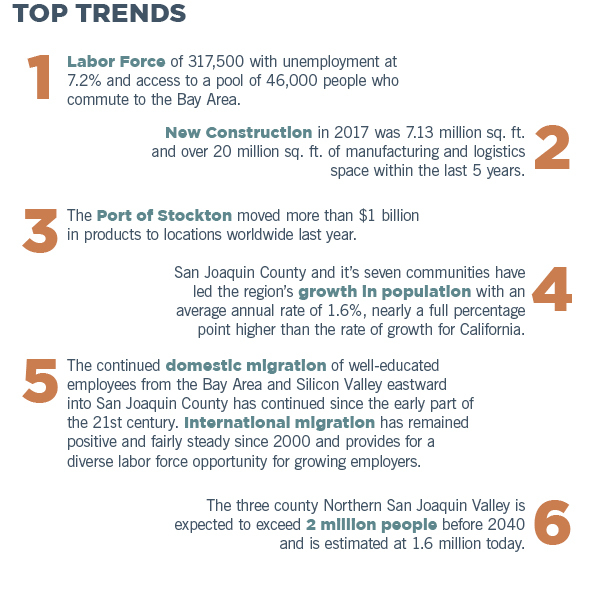 Amazon – 2,809,865 sf (four buildings), 6,100± employees – the Seattle-based online shopping giant located 3 new facilities in Tracy, Stockton & Manteca. ATI, (Air Transport International) a full-time air cargo service has started operation at the Stockton Metropolitan airport with a temporary 25,800 square-foot open sided structure next to aircraft. They are leasing office space in the terminal building and have 200 ground handlers working at the cargo ramp daily. International Windows (Universal Molding Extrusion Company) – 318,320 sf, 75 initial jobs – relocated its window fabrication operation to Stockton from its Bay Area location. Medline Industries, the nation’s largest privately held manufacturer and distributor of medical supplies and services has constructed a 1.1 million square foot state-of-the-art northern California distribution center in the Prologis International Park of Commerce in Tracy. Kraft Heinz -The global food and beverage powerhouse just recently announced that they will be leasing a 723,000 square-foot portion of the project being dubbed the North Crossroads Business Center – the reclaimed float glass manufacturing facility that will serve as the consolidated distribution center for the company’s tomato plant processing facilities throughout the area. 25-30 employees. Tesla Motors, Inc. – 430,770 sf, 120 initial jobs – expanded to Lathrop with a component of its auto parts manufacturing process to service its Bay Area automobile factory. Trinchero Family Estates – 700,000 sf expansion, has doubled wine-processing capacity at its Westside facility in Lodi, California and added 400 new jobs. Spec Building- Currently one 795,000 square feet spec building is available and another 12 are under construction in San Joaquin communities.